As much as I don’t like to admit this, I find it easy to get in cooking ruts. While the things I bake never really lack in variety, I feel like all the dinners I make are Italian, Greek, or Mexican. It’s a goal of mine to experiment with other kinds of cooking, like Asian, Middle Eastern, Indian, etc. I’m not that picky and I like trying new flavor combinations, so I shouldn’t be letting cooking ruts happen! I’m not sure how authentically Caribbean this meal was, but it certainly was delicious. The chicken is coated in a flavorful, spicy marinade that includes cinnamon, cumin, allspice, and chili powder. Don’t be scared of the cinnamon- the spices work really well together. 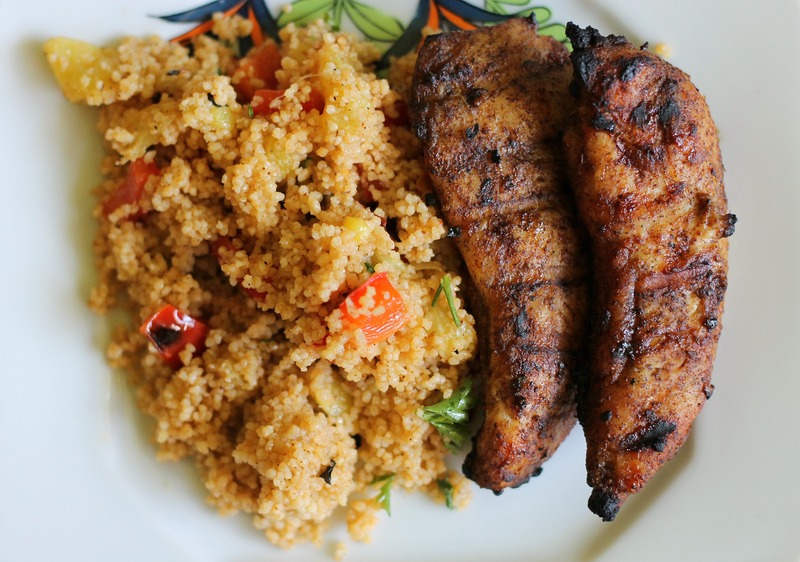 Some of the marinade is set aside before it’s added to the chicken, which is stirred into the couscous salad. The couscous salad is made amazing with the addition of grilled red peppers and grilled pineapple. The pineapple was so good that I want to add it to every meal from now on! This dinner came together fairly quickly (all the steps are very easy), and considering the fact that it uses the grill, it may just be an ideal summer meal. In a medium bowl, whisk together 1/4 cup oil, garlic, cumin, chili powder, allspice, cinnamon, 1 teaspoon salt, and 1/2 teaspoon of pepper. Measure out two tablespoons of the marinade and set aside. Add the chicken to the remaining marinade; toss to coat. Brush the pineapple and bell pepper with remaining 2 tablespoons of oil and season with salt and pepper. On a gas grill, turn all burners to high and allow to preheat for 15 minutes. Oil cooking grate. Place the chicken, pineapple, and bell pepper on the grill. Cook, turning as needed. The pineapple and bell pepper should be spottily charred and the chicken should be well browned and register 160 degrees (8-12 minutes). Transfer the chicken, pineapple, and bell pepper to a platter and tent loosely with aluminum foil. Combine the boiling water and couscous in a large bowl, cover, and let sit until the liquid is absorbed and the couscous is tender (about 5 minutes). While the couscous is soaking, cut the pineapple and bell pepper into 1/2-inch pieces. Fluff the couscous with a fork and fold in the reserved marinade, pineapple, bell pepper, and parsley. Season with salt and pepper. Serve the couscous alongside the chicken. Enjoy!